Diploma in Textile Engineering Admission Result 2018! Textile Diploma Admission Result 2018 will publish by the Directorate of Textile (DOT). Jute Technology Admission Result 2018 is published by the DOT. The procedure to get the result is available here. The student who is looking for textile admission result doesn’t worry. You can know the process to get your result from this article. We also provide the diploma in engineering admission result. The application process of diploma textile admission is briefly discussed on our website bdresultonline.com. 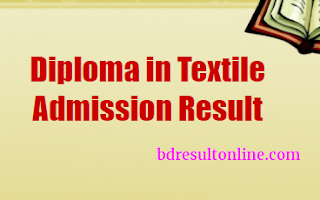 Textile diploma admission result 2018 can easily get after reading the article. The application starts on October 12, 2017. And the online application ends on November 30, 2017. The result will publish on dot.gov.bd website. So you can the result from that website. The student can also get Jute Technology admission result from this website. You can also get the result from titangail.gov.bd, arstecb.com, dtec.edu.bd, and dot.teletalk.com.bd. An SMS will also send on your mobile phone. This SMS will send by the Directorate of Textile. In this SMS contains your admission result. The institute which you are chosen for is also available in the mobile message. Online application start Date: 12 October 2017. Online application end date: 30 November 2017. Result publish date: 12 December 2017. The result of Diploma in Jute Technology Admission 2018 will also publish on the same day. The application starts from the same day of Diploma in Textile admission date. So all the process are same for Jute Technology and textile diploma admission. Jute Technology student can also get the mobile message which contains his result details. You also must send the message to the application. You know the message procedure if you read our another article of diploma in textile admission. For student help, we provide the seat number of each institute. Textile Institute, Bajitpur, Tangail contains 80 seats. Textile Institute, Pulhat, Dinajpur contains 80 seats. Diploma in Jute contains 80 seats. Shahid Abdur Rab Serniabat Textile Engineering College, Barisal has 80 seats. The total number of seats is 320. So it is very difficult to chance on diploma in textile engineering. Nowadays, a huge amount of job vacancies are available for the diploma in Textile engineer. So this is the most important subject for Bangladesh. The student who passed from textile engineering can get government and private job. There are many textile mills in Bangladesh. So they can easily get the job in these textile mills. Bangladesh earns a huge revenue from the textile sector. So this subject is very effective for the job. We also provide all kinds of diploma admission notice and result on our website. The student can also get the diploma semester final result from this site. We provide SSC, HSC, PSS, JSC and other government result and routine. For any problem comment us on the comment box. We try to help you. So stay with us for more information. Thank you.